Introducing the world premiere of World Of Tomorrow 2, the sequel to the Oscar-nominated short film described by The A.V. 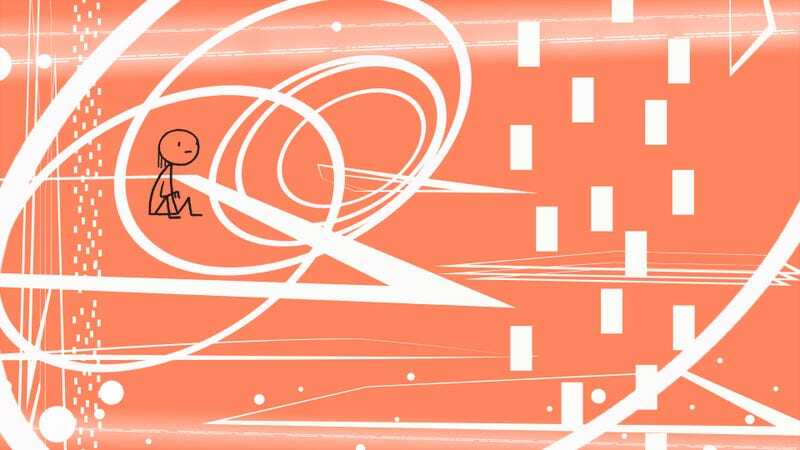 Club’s Noel Murray as one of the best films of 2015, Don Hertzfeldt seemed tired. Years spent alone in a dark room doing painstaking work on rickety equipment—in the Q&A, Hertzfeldt said that he’s going to have to change up his usual Photoshop and Final Cut technique soon, as his computer keeps crashing—can skew your perception of what you’re making. Basically, Hertzfeldt wasn’t sure if what he had made was any good anymore, and he asked the Fantastic Fest audience simply, “Please, don’t ruin this for me.” That sort of fatalism isn’t surprising coming from one of animation’s most existentialist artists, but the caveat was unnecessary: World Of Tomorrow 2: The Burden Of Other People’s Thoughts (Grade: A) is as funny and poignant as its predecessor. The film once agains opens with Emily Prime (voiced by Hertzfeldt’s niece Winona Mae), who’s innocently coloring pictures when she’s visited by Emily 6 (Julia Pott), an “incomplete backup of a third generation Emily” looking to fill in the gaps in her glitchy memory by fusing her consciousness with the original article. Thus begins a journey inside the two Emilys’ minds—where World Of Tomorrow looked outward into deep space, World Of Tomorrow 2 ventures inward, rather like a bleaker version of Inside Out. There, the two Emilys drift through the formless cosmic soup of their merged memories, making stopovers in parts of the brain unique to adulthood (The Bog Of Reality, from which Emily Prime can pull hopes and dreams inaccessible to her adult clone) and childhood (Triangle Land, an innocent, happy, absurd place rendered in vivid pinks and greens). Building upon the universe of World Of Tomorrow, World Of Tomorrow 2 takes us through a lifetime of memories Emily 6 knows to be painful, even when she’s not quite sure why. The film also builds on the theme of memory as identity, using the existential emptiness of clones—“dying is one of my least favorite things to do,” Emily 6 tells her younger counterpart—to portray our personal histories as a burden, yes, but a precious and fragile one. (Future Emily clones envy Emily Prime’s experiences so much, they take vacations through time to experience them first hand as “memory tourists.”) By wanting to replace her traumatic past with the Eden of Emily Prime’s mind, Emily 6 is also erasing herself. But while it’s a moving film with big questions on its mind, World Of Tomorrow 2 is also an endlessly charming and funny one. (The description of one character as having “the haircut of a man who has severely misinterpreted himself” got a big laugh from the crowd.) In the post-screening interview, Hertzfeldt spoke of seeing changes in his niece as she grows (she was 4 when the audio for World Of Tomorrow was recorded, and is 5 and 6 in the new film), and how her increasing self-awareness makes it more difficult to capture the free-flowing imagination that has informed both of the World Of Tomorrow films. Hertzfeldt says he is interested in continuing the series, but has an idea for the next one that won’t involve the Emilys at all; whether prime or clone, on the screen or in real life, time keeps marching on.